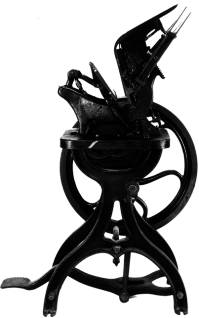 The Novelty, a press designed specifically for popular use, also found a good market among tradesman. It was invented by William Tuttle, a Boston druggist, for his own use in business. In 1867 Tuttle and his partner Benjamin O. Woods, also of Boston, patented the press and introduced it to the market under the slogan, “Be your own printer.” The press was a hand-inker with foot lever (or optional hand lever for the smallest size), made in four sizes from duodecimo (5×7) to folio (15×20), and was sold for serious prices ranging between fifteen and fifty dollars. Later a self-inking version (pictured above) was made, with treadle and flywheel. Woods died in 1873, but many thousands of Novelty presses were sold before 1887, when the company was bought out by rival William Kelsey (whose presses included the popular Excelsior).